Martin's third book will require two seasons and an army of new faces. The trouble with writing a series where characters die constantly is that you'll need fresh faces to refill the roster. This is a problem that HBO is both ready and willing to tackle with the latest season of Game of Thrones, the popular adaptation of George R.R. 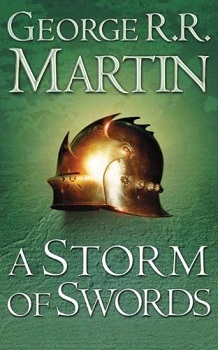 Martin's fantasy series A Song of Ice and Fire. The first two seasons left a few holes in the cast, and no fewer than 12 new characters will step in to fill their leather boots. Furthermore, Season 3's source material is so dense that it will require Season 4 to tell the second half of its tale. While not every single character from Martin's doorstopper A Storm of Swords will appear in the upcoming seasons, the network wants to include as many personalities as possible without overwhelming the audience. "If you hurl 300 characters at an audience, the story collapses under the weight of too many faces, too many names, and too many subplots," says David Benioff, one of the Game of Thrones showrunners. "We need to be just as mindful of the audience members who have never read the books as we are of the readers; the series will fail if we only appeal to those who already know the characters. So we try to be parsimonious about how many new roles we introduce to the story and when we introduce them." Among others, Season 3 will include Mance Rayder, Jojen and Meera Reed, Beric Dondarrion, and Thoros of Myr - in other words, knights, priests, siblings, and other personages you might expect to find in an epic fantasy story. If your favorite character didn't show up, don't write him or her off just yet; Benioff adds that the list is far from definitive. "[Holy] hell," he continues, "that's a lot of new faces." Casting for these roles has not yet been announced, but once it is, you'll have at least two seasons to get to know them - provided they don't get impaled within the first few episodes. That sort of thing has been known to happen in the Seven Kingdoms.